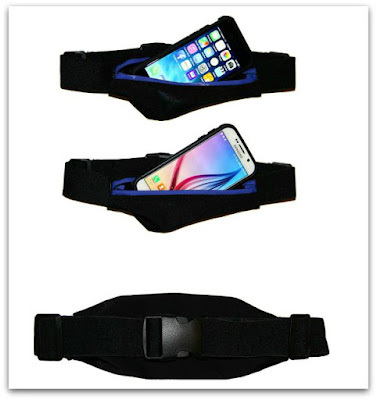 The Airbundle Smartphone Exercise & Running Belt ($12.99) is not a “fanny pack” by any means! I state this because it was my initial fear, but this sleek belt is perfect for carrying necessary items when you’re exercising -- running, hiking -- or even just on the go. It’s made of durable fabrics - Nylon, Lycra and Neoprene and I found no inconsistencies within the construction of the belt. The belt also features plenty of room for a phone, ID, keys and cash. And it the strap is expandable, so it easily fits my larger housemate or me. I received one in black, but the belt is available in blue, green and pink as well. Designed to be compatible with the iPhone 6 (4.7), iPhone 5/5S, iPhone 4/4S, iPod Touch, Samsung Galaxy S6, S5, S4 S3, Moto X, HTC One phones and more from all carriers. You can get your own Airbundle Smartphone Exercise And Running Belt on Amazon.